For over 16 years, TradeTech has been Europe’s premier event for senior equities trading professionals. Join over 1200 senior equity leaders in Paris this April (24-25), with 500+ senior buy side in attendance from global asset managers and hedge funds. Learn from 80+ buy side heads of trading who will show how investing in smarter analytics and becoming a more quant-driven desk helps to compete in this increasingly competitive landscape after MiFID II, how can the market access new liquidity sources and discuss a post-Brexit equity landscape. Join Europe’s key market participants together to discuss and debate the latest in market developments, regulations and technology innovation in the equity trading landscape. 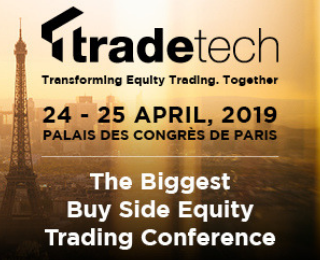 To find out more about TradeTech 2019 including who will be speaking and the sessions they will be covering, take a look at the event brochure here. As a reader of FinTech Futures you can save on your ticket with an exclusive discount code. Quote: BANKING19 when booking here.